Even the October WASDE is not expected to move price much, especially longer term, but next up for markets is whether South American corn, soybean and wheat surpluses expand or contract. NASS’s US production estimates are likely pretty close in corn and beans – bean yield may be overstated 0.5-1.0 Bu/Acre – but moving forward it’s all South America. And South American weather, while it’s very, very early, has been far from ideal. It simply hasn’t rained in Central and Northern Brazil, where a vast majority of soybeans are grown. 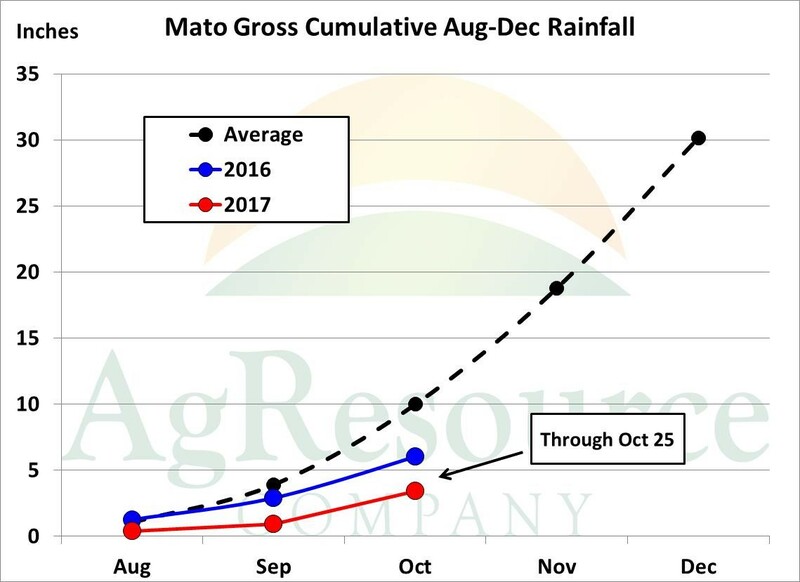 The state of Mato Grosso, which by itself accounts for roughly a third of Brazilian bean production, has yet to see a complete transition to the wet season, and is abnormally dry. The graphics above and below make this clear, and even the two week forecast lacks needed moisture. Cumulative Aug-Oct rainfall, on average, rests at 10”, but so far only 3” will have been recorded by the end of the month. Longer term climate guidance also lacks any meaningful pattern change through early November, and Brazilian dryness will grab more attention should it continue thereafter. This has no real impact on soy yields just yet, but is important to the overall crop calendar. 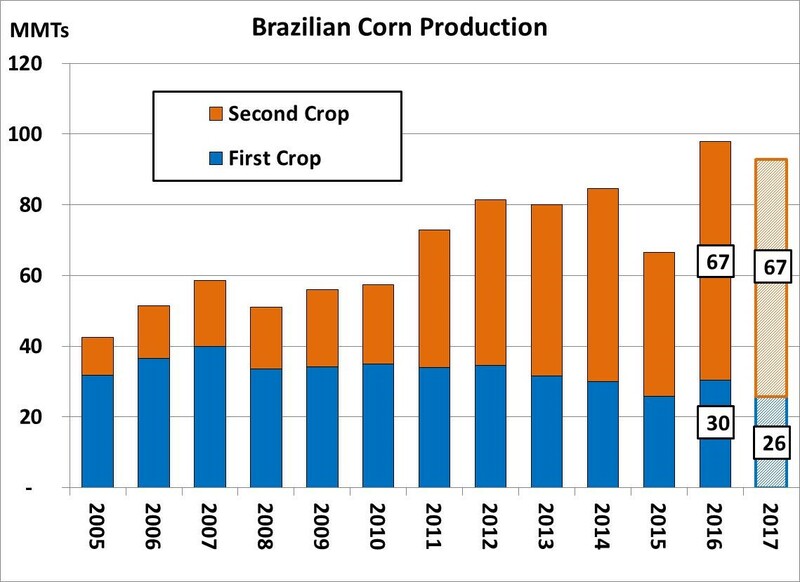 Safrinha corn, or Brazil’s second crop (planted after soybeans), now accounts for a record 70% of Brazil’s total corn harvest. Between now and next February, which is the optimal time for planting safrinha corn, a bean crop has to be planted, grown and harvested. Already soybean planting is noticeably behind last year (10% complete, vs. 18% complete on this week in 2016), which needs close watching, as there’s no doubt that rainfall in Central Brazil shuts off completely in early June. This year’s dryness has delayed seeding, which could have major consequences for corn production next summer. 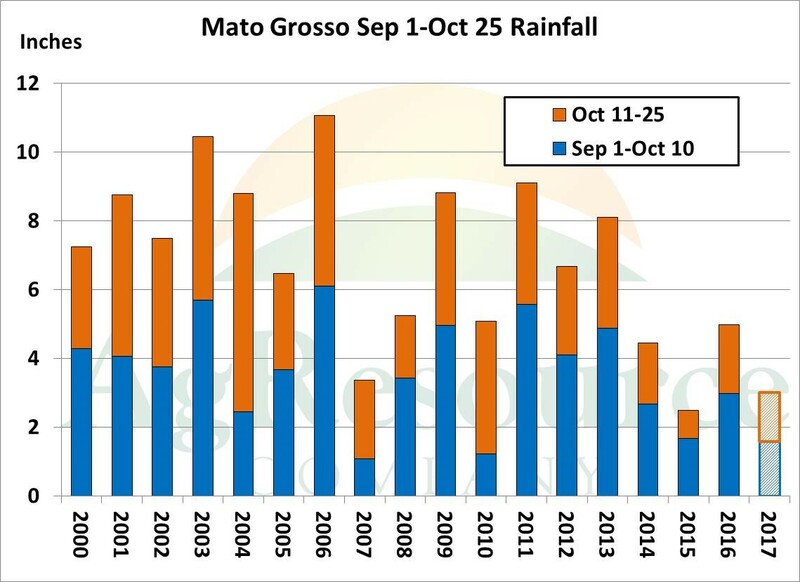 We all wait for seasonal rains to arrive in Brazil, but so far this shift is not evident.